The launch of Artbeat Alumnus Darcy Kerr’s art show will open on Friday October 3rd. Its on the First Friday from 5:00 – 9:00 p.m.
Artbeat Studio’s new boutique Upbeat Artworks is now open in Portage Place Shopping Centre. Boutique hours are Tuesday thru Saturday 10 a.m. to 6 p.m. Come visit us at Unit 207, Portage Place Shopping Centre (2nd Floor). Our featured artist Cassandra Kuly on exhibit for one more week. Cassandra’s colour experiments and narrative paintings provide for a deeper reflection and interpretation. The Recent Alumni Gallery features the work of Michelle Pahpasay, Rowan Lorenz, Sara Maximus, Yekaterina Kaplun, Marlyce Friesen, David Henry, Hanna Friesen, Heide Owens and Holly Enns. Please come to the studio to check out the new exhibits. Extended Options resumes the week of October 7. This includes Self Directed Saturday, the Facilitator’s Master Class and Thursday Performance Rehearsal. Our day programs are in full swing. 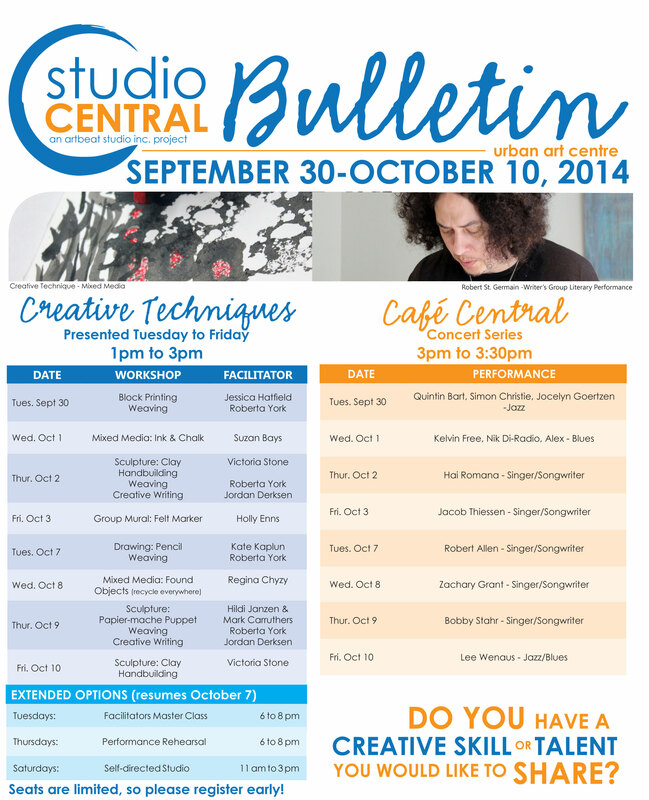 We look forward to seeing you at the Studio! You can download a PDF print version of the Bulletin here, and keep up to date with the online Events Calendar here.